viaLibri ~ Keeping score at the 1865 Tufts University baseball game between the sophomore and freshman classes, as recorded in an autograph scorecard, an inning-by-inning columnar account, set up similar to the scorecards in use today, showing the results of each at bat and with end-of- the-game summaries, including "flies caught," "flies missed," and "left on bases"
Keeping score at the 1865 Tufts University baseball game between the sophomore and freshman classes, as recorded in an autograph scorecard, an inning-by-inning columnar account, set up similar to the scorecards in use today, showing the results of each at bat and with end-of- the-game summaries, including "flies caught," "flies missed," and "left on bases"
(Medford, MA) 1865 - Broadsheet manuscript, 8 3/4 x 7 5/8 inches, the sophomore class performance on recto, freshman on verso. The sophomore class won the game, umpired by E.A. Perry, 33-30, coming from behind with seven runs in the bottom of the ninth; with all the scoring, there were no home runs. Field positions are noted for each player. 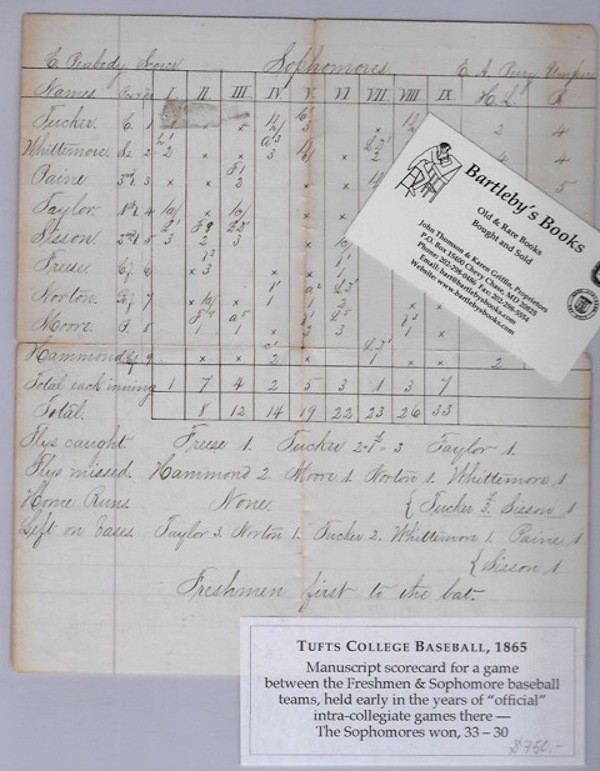 "The first official baseball game at Tufts College was played on September 5, 1863, when a team of sophomores defeated the freshman team, 9-6 . it was not until 1863 that a game was recorded as official. That year, a group of freshmen challenged the sophomore class to a game, and the next year, an official baseball program was organized. In 1864, two teams appeared on the Tufts campus, the All Nine and the Balliu Club . in 1868, the Tufts College All Nine began competing informally against other local schools. The next year, Tufts recorded its first recognized intercollegiate game against Brown University" (online "Concise Encyclopedia of Tufts History"). A few cracks at folds, lower half of verso browned; still a good example of an early manuscript scorecard for an American college baseball game. (#8480).